We are leading manufacturer of Acrylic Powder Putty. With seriousness and hard work of our personnel, we are able to offer our respected patrons an outstanding quality gamut of Solid Dry Wall Putty. We are well-known manufacturer and supplier of ViiR Super Fine Paste Wall Putty. Offered products are manufactured the finest quality of minerals, biocides, and corrosion inhibitors. These products are widely used for deluxe finishing of the surfaces and give a soft finish to the walls for the betterment of all types of paints. Fairwall Cement Wall Putty is based on cement and redispersible powder blended with extenders for Exterior & Interior. 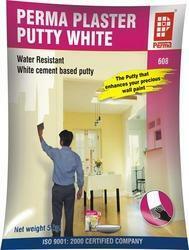 Fairwall Cement Wall Putty helps to fill dents, undulation, cracks. Fairwall Cement Wall Putty can be applied on rough concrete wall where punning is not done.